It is so easy to forget terrible events such as 9/11. It’s not that we’re insensitive. Forgetting, or at least removing traumas from present consciousness, is a necessary survival mechanism. Each of us will face many tough and tragic experiences through life. If we were to keep in the front of our minds the acute fear, anger, and sadness from each episode, we would soon be spending our days puddled up on the floor sobbing, afraid to move, heart broken, and quite smelly. So we must put the past behind. What we need to take with us are the lessons so that we decrease the risk of even more tragedy. The fear, anger, and sadness we felt on 9/11 needed to slowly move from the emotional front part of our minds, into the rational and intellectual recesses that we can draw from to be smarter in the future. Everyone has their own takeaway from 9/11. Unfortunately, after all the news, commentary, and speculation few understand the true cause. Instead, effects and peripheral issues are the focus. 9/11 was not really caused by poor homeland security, impoverished, uneducated, and abused Muslims, President Bush, oil, inadequate airport security, or American imperialism. The fundamental cause was BELIEF. Belief is what drove the terrorists to do their horrendous deed. They believed that God was telling them to do what they did. Since their God was the ultimate authority in the universe, and their everlasting life in paradise depended upon them doing His will, what choice did they have? To them, their act was the ultimate morality. The lesson of 9/11 is that belief drives actions. So if we are to be better people and make a better world, we must be darn sure our beliefs have been carefully crafted using reason and evidence, and then critically examined in the light of new evidence as it emerges. We must commit to the process of truth seeking, not the implementation of given beliefs. That leaves out beliefs we were born into, faiths that were hammered into us by parents, schools, or other authority figures and organizations. The only God we can ever know is truth. After all, there is a truth underlying our world, our existence, purpose, and destiny. If truth isn’t God, what could be? However, since nobody can claim complete knowledge of that truth (God), our lives must be about openly pursuing it. That can only occur without the prejudice of preexisting faith, and with absolute allegiance to reason, facts, and evidence. It means that at some point in our lives we must wipe the slate clean, use our conscience, reasoning faculties, and the evidence that exists in reality to form our views. This process must precede belief; a priori belief should not be used to twist our reasoning or shoehorn facts. Seems simple enough, but almost nobody does it. To have even a moment with no belief—to wipe the slate clean—is too terrifying. The brutal honesty required for that moment requires far too much courage. It’s so much safer to remain swaddled in the arms of our surrogate mommies and daddies: our beliefs and faiths. So we myopically plod on with our comfy, safe, and secure beliefs and faiths…and then bemoan the inevitable 9/11s that result. 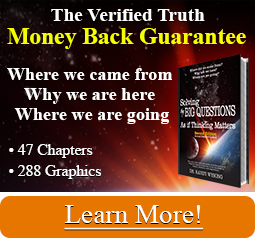 This process of truth seeking is the basis for the two Thinking Matters books. Use them to find the honesty and courage to wipe the slate clean, and start anew with a mind, heart, and conscience that you truly own. They will help you find answers that can transform your life and the world.